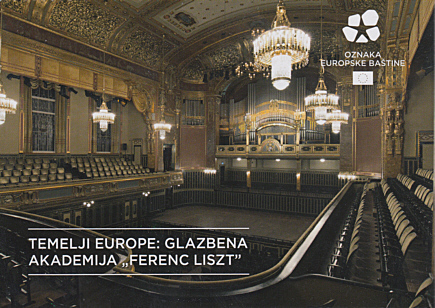 Concert hall of the Ferenc Liszt Academy of Music (Liszt Ferenc Zeneakadémia, also known as Liszt Ferenc Zeneművészeti Egyetem). Named in honour of the Hungarian composer, Ferenc (Franz) Liszt (1811-1886), the founder of the Academy. Built 1907 by Flóris Korb and Kálmán Giergl.